To continue with our theme for the day, I'm pleased to recommend to you a fascinating book, part memoir, part historical analysis, part family history, part personal meditation: Andrew Himes's The Sword of the Lord: The Roots of Fundamentalism in An American Family (the facebook fan page of the book is here). As mentioned in the last post, this book arose from Himes's own struggles with his own family legacy as the grandson of the legendary fundamentalist leader John R. Rice. Historians love Rice; he's an endless source of colorful quotations from his paper The Sword of the Lord and from his various books, most especially his Bobbed Hair, Bossy Wives, and Women Preachers -- thesis of which is that he didn't like any of them. You can't heave an egg out of a Toyota Prius window without hitting a historian of 20th century evangelicalism who has referenced that book somewhere in his/her work. This 1941 book is short but really all you need to do is read the lengthy table of contents, one of those great table of contents that books used to have in the 19th century and are the historian's best friend -- check it out at google books here. Seeking to understand his own family's history, Himes goes long, examining the long history of Scots-Irish immigration to America and the rise of a particular style of southern evangelical Calvinism in the 19th century. He examines the Rice family in post-Civil War Texas, a surefire training ground for a hardened religious view, and then makes his way to the more familiar (to historians) story of the creation of what became known as "fundamentalism" in the early twentieth century. For me, the highlight of the book is the opportunity to get to know John R. Rice and his family in intimate detail, a kind of thing I've never seen elsewhere before. Himes mines the family archives beautifully, and the end result is exactly what one hopes for in history, a much fuller and richer understanding of a person who elsewhere almost always appears as a virtual self-parody of fundamentalist rigidity. We also get close accounts of Rice' s interactions with almost everyone on the fundamentalist all-star team -- Billy Sunday, J. Frank Norris (whom Rice worked closely with in Texas before discovering what a narcissistic psycho Norris was), Mordecai Ham, William Bell Riley, and pretty much everyone involved with Billy Graham (whom he admired but with whom he eventually broke, as Graham was too broadly evangelical for Rice's tastes). That's not to say that Himes shies away from the uglier parts of that history, including the very active participation of his great grandfather (Rice's father) in the Texas Klan, Rice's own racist predilections, and so on. But he treats all this with historical understanding, and feels connected always to Rice through Rice's wife, his grandmother, who stayed in contact and continued to love the author even after he had broken from much of his family. Preach on booze. Preach on the scarlet sin, adultery. Some cheeks will turn red with sahem, and some won't like it, but it will bring people to repentance. Preach on the dance, tell people it is rotten as sin. Tell people they dance because they enjoy the lust. . . Preach on the movies made by vile, lewd people, holding up rotten moral standards, breaking down respect for marriage, pure love, hard work . . . Preach against the Masonic Lodges. Preach against evolution, and false cults. Preach on death, sin Hell, judgment! This is a different sort of text than the academic volumes we normally focus on here, and this book might not have come to my attention except for my own connection (through friends of my Oklahoma family) with people related to the author. For those familiar with the topic, the details of the birth and rise of fundamentalism will be reasonably familiar, but all of this is given with a personal twist and poignancy that sheds new light on the topic. I learned an awful lot about the history of fundamentalism and some of the individuals associated with it, and recommend the book to all. Thanks for calling my attention to this, Paul. I wrote my M.A. thesis on separatist fundamentalism--John R. Rice, Bob Jones, Carl McIntire. I have often thought I would return to McIntire one day. Thanks, Paul. Very interesting piece. I do want to read the book. I recall reading (perhaps it was in a work on Wheaton College by Michael Hamilton) a moving and poignant piece about Rice packing up the car and taking his daughters to Wheaton College. I'm certain I read this when I was doing research (some years ago) on the transitional moment in fundamentalist history (in the 1940s), when younger leaders like Carl Henry were urging fundamentalists to become more culturally informed and socially engaged. I hope I can find that story's origin as it stands out in my memory. 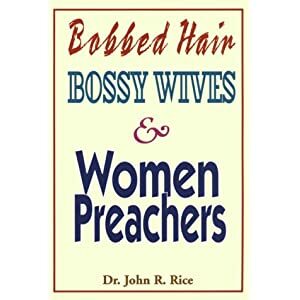 Where do I get a copy of _Bobbed Hair, Bossy Wives and Women Preachers_? That has to be the best title that I have run across in awhile. It tells this reader all she needs to know about ideal gender norms within fundamentalist circles. Kelly: it remains popular on amazon, lots of used copies there! Paul, thanks for reviewing this. Andrew Himes is my uncle, and I helped out with this book with editing and reading multiple drafts. I've been following this blog for a while, as I am intensely interested in the subject of American religious history and do my own writing about it, focusing on fundamentalism, so I was glad to see you review this. John, if you see this comment, I'd love to read your M.A. thesis, if you don't mind sending it out. My e-mail address is jstephenlamb at gmail.com. And if you haven't read Barry Hankins's bio of Francis Schaeffer, I commend it to you for its discussion of McIntire. I've often thought that while it is his own fault that Rice's legacy has to live up (or down) to "Bobbed Hair, Bossy Wives, and Women Preachers," it's a shame that a man who raised fives daughters to be intelligent, formibable, often outspoken women. I knew them all when I was growing up with their daughters and I have often felt saddened that Rice has been stuck with such a one-dimensional characterization (even though, like his grandson, I disagree with so much that he stood for). I'm glad to see this book filling out the picture.